Getting ink permanently etched on skin is a major decision, and having the right artist can make a huge difference. Lucky for us tattoo lovers, Belizean Ink Tattoo Shop is once again hosting an expo after the runaway success of last year’s. From May 26th to May 28th, artists from all over Belize, Central and South America, and even the USA, will convene at the San Pedro High School auditorium for a great weekend of art, performance, ink and camaraderie. Whether it’s your first tattoo or you’re scrounging for space on your skin for another bit of ink, you cannot miss this event! Organizer and owner of Belizean Ink, Wimpas Sosa says this year will be even bolder and bigger! Apart from the highly anticipated freak show performance of Victer Max on both nights of the expo, rap artist from Los Angeles, CA, Spanky Loco will be providing some entertainment on Saturday, May 27th. Coming Up this Weekend in San Pedro, Ambergris Caye. Tattoo Expo is Back!! We revisited the international Belize Tattoo Expo this past weekend and walked out the arena totally impressed with the works of art by the professional tattoo artists but also in shock after we witnessed the freak show that was part of the expo’s entertainment lineup. 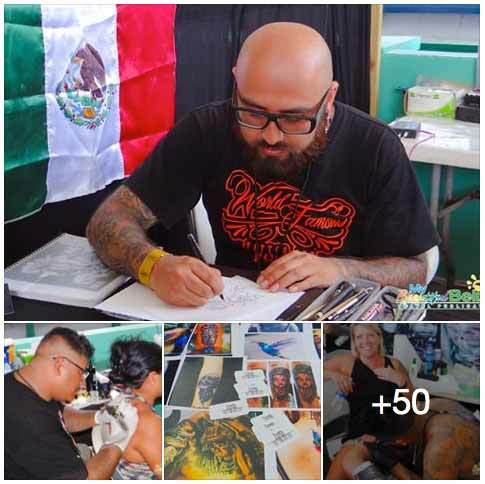 The buzzing of tattoo guns filled the air as we witnessed artists from Mexico, Brazil, Costa Rica, USA and Belize, each unique in their style, technique and skill. We were three of hundreds who went to enjoy the two-day tattoo expo; there was plenty of artists at work to admire, food, souvenirs and entertainment. People getting inked everywhere, fire dancers and the freakiest Freak Show ever! That's just what the Belize Tattoo Expo is all about. Amazingly talented tattoo artists convene at Las Isla Bonita, San Pedro, Belize for some sun, sea, beach, adventure and plenty of tattoos.